Last evening we saw Sylvester Stallone’s latest movie, The Expendables 2. Along with Stallone the lead actors are in their 50’s and 60’s. It is one of a growing genre of movies intended to appeal to people who aren’t ready for their favorite action movie stars to quite yet ride off into the sunset. I love those guys, but must admit that they are getting a little wrinkled around the edges (and other not-so-good stuff in the middle too). This week we are in Tallahassee, FL moving one of our daughters in as she begins a new college year. Our older daughter, who goes to school in Pensacola, joined us. By way of complete transparency and in the spirit of true disclosure, Katherine thought it to be an utterly ridiculous flick (though I caught her laughing a few times). And it is only fair to divulge that a young man we have known since infancy accompanied us, and commented that you could tell that an old man wrote the story. Can you really tell that? Undeterred, I on the other hand, loved it. Thoroughly. It is a shoot-em-up, funny, satirical movie that incorporates a host of bygone actors who once dominated the action movie scene. Our daughters enjoyed the action, the subtle and overt humor (references to Die Hard, The Terminator and other similar movies whose stars had roles in this one), but they only went because the old man wanted to see it, and the old-ness of the heroes and story weren’t lost on them. In 1976, when I was 17, four of us saw the original Rocky after realizing we would be late to King Kong, the movie we had intended for our double date. I never did see that movie, but I took my best friend and two other dates to see Rocky after on three different occasions, and have since seen every sequel. Sadly, they didn’t measure up until the final installment, Rocky Balboa, which was quite good. 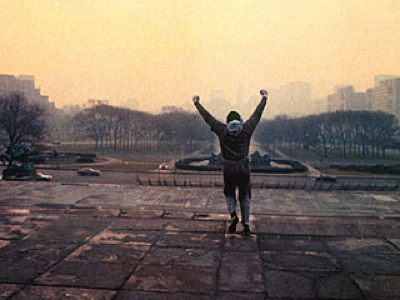 The photo in this post is from the iconic penultimate scene in the first movie where a formerly out-of-shape, unrated boxer has been transformed into a fighting machine that is able to bound up the steps of the Philadelphia Museum of Art with ease to the tune of Gonna Fly Now, that unforgettable movie theme. As we sat in that theater last evening, it struck me that by humoring their father in going to a movie they wouldn’t ordinarily be caught dead at, our children had entered into a story that began when I was younger than they are today. It is easy to miss this. We are not only unfinished because we aren’t yet home, but also because our own stories find some continuing measure of fulfillment as others enter into them, and we into theirs. We weren’t created to live in isolation. From the moment of God’s pronouncement in the Garden, it has never been ‘good’ for us ‘to be alone’ (Genesis 2:18). We are all designed with the need to connect. Painful experiences and damaged relationships have a way of driving us into isolation, but the gospel is a reconciling force that draws us back towards community, into the company of others. And while it is tempting to quarantine ourselves from the more uncomfortable and untidy elements that others write into the narrative that is our lives, we are the better when we enjoy the messiness of human contact than the sterility of seclusion. I don’t mind saying that I have grown old with Rocky. But last night it hit me that for a few hours, together, as we watched Sylvester Stallone pretend to be able to do things no 66-year-old can actually do (well, at least this 54-year-old can’t), and as we laughed at the stars’ own self-deprecating humor, we had entered into one another’s lives. And this strikes at the heart of what Jesus did in reconciling us to the Father. He simply entered. You are currently browsing the Rocky category at unfinished1.